Animal sanctuaries are not something Penang is known for. That being said, I happened to visit 3 places that care for animals during my time there so I decided to comprise a small and opinionated list. I’m usually sceptical about places like these, especially when travelling, due to the horrific stories of animal exploitation that once in a while are brought to light about venues that advertise themselves as “sanctuaries” but as it turns out exist solely for the amusement of tourists and don’t do any conservationist work, be it the infamous elephant rides or “tiger parks”, amongst other less evident cases. I avoid visiting zoos and I am highly wary of places where it looks like the animals might be subjected into submission so tourists can interact with them and take photos. That type of lack of awareness and respect for animals makes my blood boil. The Penang locations listed below, proved to me that, despite the flaws I point out, there seem to be people who are passionate about animals and their welfare. Home to almost 300 cats, this sanctuary is based right on the beach in Teluk Bahang, a fishing village on the north-western tip of the island. I was not sure how to react when we reached the Cat Beach Sanctuary. At first I was overwhelmed by a feeling of sadness at the sheer neglect these animals have experienced. But that feeling quickly dimmed and turned into gratefulness after seeing that these cats are better off here and being taken care of. You can even sense that by interacting with them. It’s a ‘no kill’ shelter run with the help of volunteers that is actively encouraging adoption of these less fortunate cats that have been rescued from the streets. 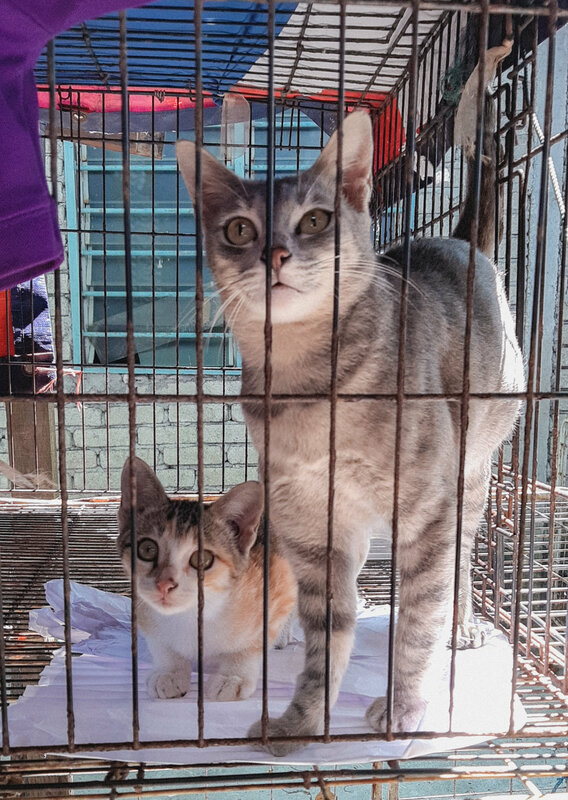 The number of cats in the sanctuary has tripled over the years as stray animals and cats in particular is an ongoing issue in Penang and Malaysia overall. A lot of the rescued cats here have been saved from life or death situations with terrible injuries and signs of abuse. The cats do receive basic healthcare here but due to financial problems, the people running the Sanctuary are struggling to provide medical attention to all of the cats that might need more expensive treatment. It is a non-profit organisation so they depend heavily on donations and volunteers. For most part the cats roam around freely and many are welcoming to human interaction. We did see some in cages, our informed guess being that those would be the ones who have sustained and are recovering from injuries, or are being held back from the others for behavioural reasons. Some of the young kittens were in cages too, which is reasonable if the mother is not around to take care of them. Cats are fed twice or three times a day, they get fresh water and plenty of attention from volunteers and visitors. You’re gonna have to sweat a bit to reach it. The only free-entry means to get to Kerachut, also known as Turtle Beach, is hiking through the National Park of Penang. Marine turtles are endangered animals and unfortunately their biggest predators are humans interfering with nature. Turtle eggs and even their meat are considered a sort of ‘delicacy’ based on assumptions of its nutritional value and usage as an aphrodisiac. In Malaysia, the sale of turtle eggs has only been banned in the states of Sabah and Sarawak. Without a nationwide ban in place, the trade of turtle eggs is legal unless they have been taken from protected beaches such as this one, but smugglers can easily get away with it by saying they caught them abroad or from another site. Malaysian waters are home to 4 turtle species – leatherback, green, hawksbill and olive ridley. 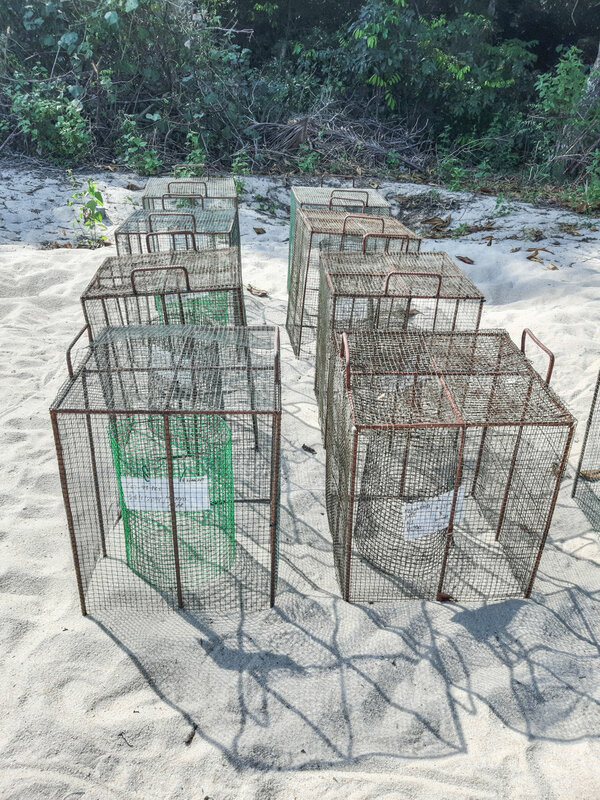 This turtle sanctuary serves the purpose of protecting and preserving the declining population of turtles in the country. These animals are crucial to the ocean’s ecosystem. For example, green turtles graze on the seagrass, therefore not letting it overgrow and increasing the sea’s nutrient dynamics, while leatherbacks feed on jellyfish which in turn controls their population from becoming excessive and affecting other marine life. Turtles come to Kerachut beach to lay their eggs which are then protected from predators until they hatch up to 60 days later. The baby hatchlings are kept in a pond in the sanctuary until they are old enough to be released giving them a better chance of survival and reaching adulthood. Hopefully, once fully grown, they will return to their place of birth to lay their own eggs. We also saw some tubs with adult turtles in them, which at first really confused me as to why they are being kept there. There was nobody there we could ask but some research has led me to believe that some adult turtles are kept there temporarily if they have sustained injuries, so they they can receive proper treatment, or for carrying out research work. Overall, I got the sense that they truly care about the animals and are not there to showcase them for tourists. 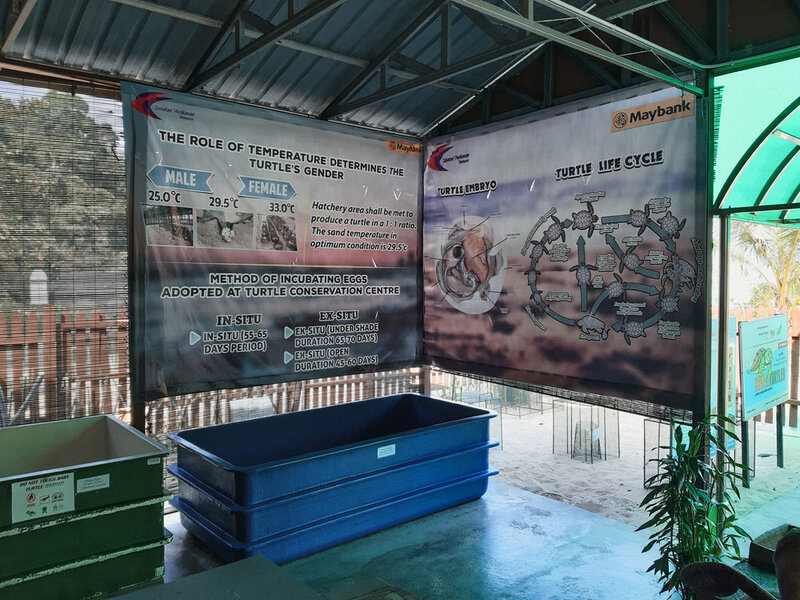 This sanctuary is government funded and it’s great to see them acknowledging the importance of these beautiful animals but there is definitely more that could be done to provide adequate protection such as nationwide legislation against the trade of turtle related products to avoid the loopholes in the law, alleviate the issue and help restore the dwindling turtle population in Malaysian waters. Technically I’m not sure if this could be classified as a sanctuary but I will include it due to my personal experiences when visiting. The temple itself is quite a tranquil place of worship despite its name, so don’t expect dozens of snakes freely roaming around. You will be able to spot a few of them hanging in the trees of the breeding pen in the temple grounds if you look closely (they are quite good at camouflaging). For a closer look, we decided to visit what I believe is called the Snake Farm, located at the back of the temple. It’s more of a snake enclosure. I would have thought of it more like a zoo, if it wasn’t for the owner, who approached us after hearing us commenting on what was erroneously marked as a King Cobra. She then proceeded to show us the actual King Cobra on site, and took the time to present us many of the other species with detailed commentary and insight. Not only she showed us her ‘pets’ but she also told the story behind them and the reason this place exists. She emphasised that the reason she takes care of so many snakes is to raise awareness of these animals, some of whom are now threatened due to human activity. Apparently a lot of snakes in Malaysia are being caught in the wild illegally for their beautiful skin or sold to Hong Kong as meat. We were allowed to touch several snakes, including the enormous pythons, which can be deadly. I never thought I would feel so at ease but the woman has taken care of these animals for over a decade and it was fascinating to learn so much about them. I never thought of it but according to what we learned, a snake would never attack you from behind and generally they don’t unless provoked. We also learned the background stories of some of these reptiles and why they have been kept in the farm. One of the biggest snakes in the enclosure for example, a reticulated python (the world's longest snake), was rescued after locals caught it with a goat in its stomach and took it to a restaurant to be displayed as an attraction. As it turns out, it’s very hard to reintroduce snakes to the wild after they’ve been kept in captive or as a pet, so even though the python is not much more than an attraction here, at least it’s being given better conditions and handled by educated and caring staff. 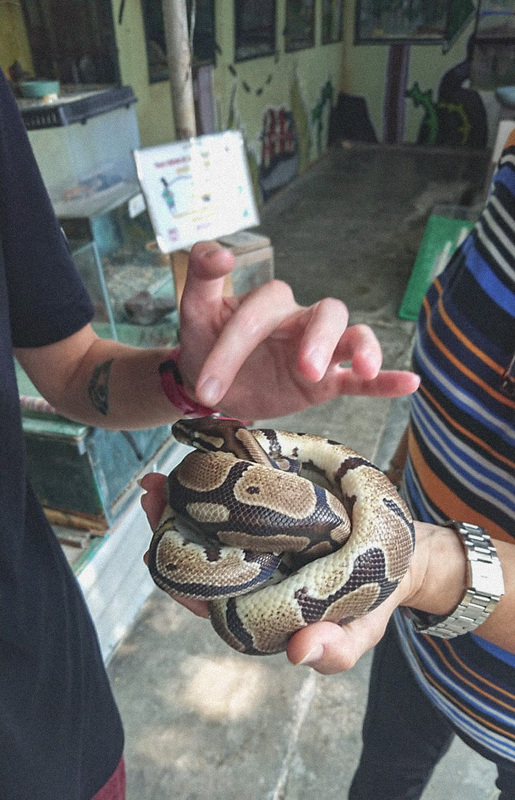 There are vendors outside the temple trying to get you to take a picture with another big snake, which will cost you a small fortune, so I would rather spend the little fee asked to visit the farm instead. The temple is located in the southern part of the island, not too far from the airport. It is quite a long way from George Town but it is reachable via public buses or GrabCar.